After church last Sunday I had the privilege of taking Ebbie to a Tennessee Titans – Philadelphia Eagles football game. I am a huge fan and Ebbie has caught the spirit, too. 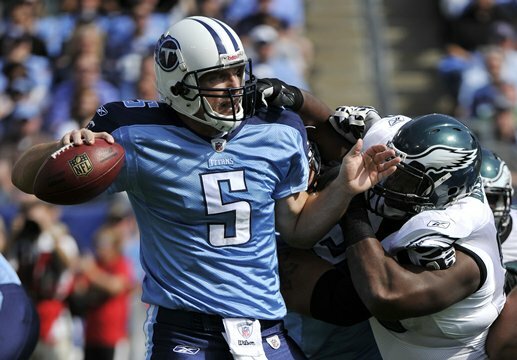 In Sunday’s game the Titans were outplayed for the first three quarters, but dominated the fourth quarter to win the game. During those first three quarters I became a bit preoccupied with what was happening among the crowd. There were a bunch of Eagle fans behind us (a drawback to being in the cheap seats). Even though our team was unable to get anything going, the crowd stayed in the game, especially when we were on defense and the crowd sought to live up to their reputation as the “12th man.” Part of my preoccupation was attracted to what all took place on the jumbo-tron scoreboard. The music spurred fans to clap in rhythm, yell responses to rhythmic patterns repeated, like a build up to a shouted response, “Go, Titans, Go!” It was a clever kind of “Question – Answer” mantra. I started noting how the entire stadium (minus those annoying Eagles fans) could be mesmerized, manipulated right into a given response by the repeated pattern setups. I actually thought some about some Gospel songs and worship songs that have a similar call – response formula. Toward the end of the third quarter I was caught a bit offguard when an old country song cranked up and before the end of the second phrase the whole stadium was singing (even the Eagles fans jumped in). The song? Johnny Cash’s anthem, “Folsom Prison.” So get the picture. 60,000 people singing along with a recording of a country band and old school country music icon about being stuck in prison after shooting a man in Reno just to watch him die. I was struck by the level of singing. Not the musicality, of course. It was mainly just loud and proud. The influence of alcohol on those around us gave them the confidence to sing out with gusto. Nobody really cared. They just sang as part of the moment; part of the experience. Interestingly, a few minutes later the Titans seemed to catch fire and, though down 19 – 10 with 13 minutes remaining in the game, they dominated and won 34-19. It was quite a game, and we had a great time, but I couldn’t get the singing experience out of my mind and relating it to what does or doesn’t happen in worship. How could a country anthem, popular as it is, be so intoxicating for a stadium full of people with no hesitancy about engaging in full throated singing, whereas Sunday worship often finds us leaders trying to coax people who say they are “believers” and/or “worshipers” into joining in a song of faith expression. Folsom Prison is not exactly a fight song, nor is it really connected to the football team, unless you count a loose connection by virtue of being recorded by a former Hendersonville, TN resident (Johnny Cash), and the whole Music City identification thing. Nevertheless, we all sang. It was fun and unifying in its own way. I could not help but wonder, though, why has the church lost its song? In the case of Folsom Prison it didn’t really matter what the words said, people were just singing to be part of the experience. In church worship, the words are important as they carry the weight of the message of the worship song. It may be that our proliferation of so much new music in church worship (much that seems to be prompted simply by the presumed need to include lots of new things), is counterproductive to encouraging people to sing their worship. In the case of Folsom Prison, the song was nothing if it was not familiar. Seems to me it would serve us well to engage people with familiar and spring from there toward whatever new material we feel helps progress the interaction of worship; Revelation and Response with God. I encourage you to take serious note of how well your congregation sings its worship. Don’t be afraid to turn cameras on the congregation and record what is or is not happening out there. Watch the video and evaluate. Perhaps enjoin the choir to assist you in worship leadership that engages the congregation by praying for the congregation, singing as admonition in psalms, hymns, and spiritual songs. If you don’t move your congregation toward participatory worship through singing; who will? Sunday I had the privilege of participating in worship leadership at the ordination service of two fine young church leaders, one of whom was one of our outstanding young worship pastors in Tennessee Baptist life. The service was the Sunday morning worship service for the church in which these men serve. This church has a special place in my heart as I was honored to have served as an interim worship pastor among them on two occasions. That special relationship seems to develop with me among those people God provides opportunity for me to serve. My relationship with the church coupled with the high regard I hold for their Senior Pastor, and the wonderful bond that has grown with their young worship pastor and his young bride, all served to make this a very special day for me as well as a rich spiritual reminder of our calling to serve with full devotion and full commitment of life. I was impressed that the church dedicated their Sunday morning worship service to this ordination. It was certainly fitting and meaningful to do so. There was a full house for worship as many guests were added to the church family for this special event. As would be expected, family of the men being ordained were present as well as members from churches the men had served previously. I felt that was an especially healthy expression of Kingdom perspective and a reflection of the effect the young men’s service has already had on the lives of those they have served. 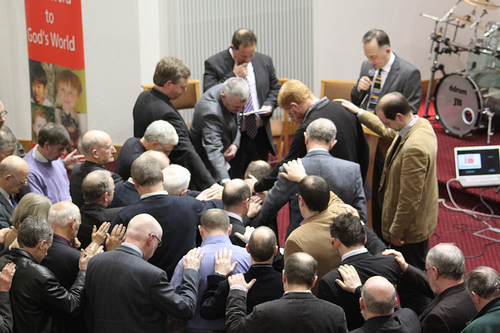 In reflecting on the experiences of Sunday’s worship in this ordination service I would like to reflect openly on three things: 1) ordination as an act of worship, 2) the pastor’s sermon and focus of last Sunday’s ordination service 3) the practice of ordination in Baptist churches. I have placed these three reflections in this order purposefully as I would invite you to reflect in the same order. #1 In some faith traditions “ritual” is not a bad word. To the contrary, it, along with its root word, “rite,” is understood as a holy moment when something of spiritual nature is occurring. In the best case, these moments give worshipers pause to remember that God is truly present among His people, expressing Himself through His Word, through the Spirit’s work in His believers, the church, and in the praises of His people calling attention to His story and their complete dependency upon Him. In fact, weekly worship should include holy moments regularly as opportunity for all of these dynamics are present when we gather to engage with God on His terms made possible through His provision in Jesus Christ. Ritual only becomes boring if worshipers are bored, which is likely indicator that there are spiritual issues clouding their grasp of the Spirit’s presence and the profound truth of the Gospel. Too often we as leaders have ceased to trust the power of the Gospel and have tried to become evangelistic by imitating those who we deem effective by their technique. Worship pastors have too frequently trusted the musical hook (usually very cliché) instead of faithing the transformational power of the Gospel sung and said to bring change in lives of worshipers by engaging them with the author of the story itself. This does not mean we do not apply creativity or art. To the contrary, we bring our best and communicate in our context, but always holding high a reflection of the character nature of the God we profess. Setting aside, ordaining, those individuals we believe and affirm that God has called to serve in specific ways as pastors, elders, or deacons is surely a spiritual act of worship whereby the church participates in affirmation and commission to, in a sense, confer rites on these individuals we say we will follow, recognizing God’s call upon their lives. #2 The senior pastor preached a message Sunday that I wish every church and every church leader would hear. It was a simple clear exposition of one of the most powerful passages in scripture, John 17, which is Jesus prayer for His disciples. Jesus states that His prayer is not only for those disciples of immediate presence in the moment, but that it included those who were to come, which means it continues right down to those of us who call Jesus our Lord. David effectively affirmed the two young pastor/leaders with whom he has already been serving for months. His affirmations reflected his appreciation for their gifts that complimented one another’s as well as his own, more indication of the Lord’s calling and work among His people. He challenged the church to follow these God-called men and further admonished them to continue to act always out of a desire to glorify God, to lift up Christ, and to love His people. The message displayed this preaching pastor’s spirit of confident humility. His attitude conveyed the heart of this sermon that drew attention to the oneness of the Father and the son, a oneness that he preached was to be reflected in the church, the body of Christ. Powerful Gospel truth! Through the words of his sermon and the actions of his service to these young ministry partners and their families, including his help in serving lunch to them at a noon gathering that followed the service, his clear message continued through his example as servant-leader. Powerful Gospel truth! We desparately need more pastors of this stripe! May his tribe increase. #3 While the Reformation stripped away some of the special treatment afforded clergy, especially in Roman Catholic practice, it left churches with the challenge to base ordination, where practiced, on firm biblical understanding. That challenge remains to this day, perhaps especially for we Baptists who claim to be “people of the book.” The word, “ordination,” does not appear in scripture, and there are plenty of Baptists who actually believe it to be an extra-biblical practice. While Baptists share a rich tradition of practicing ordination for positions of recognized leadership (especially pastors and deacons), we also claim a basic tenant to be the priesthood of all believers. One of Baptists’ most famous preachers of all time, Charles Haddon Spurgeon refused ordination, due to the sacramental understanding that was common among Englanders in his day. At the same time, there are recognized advantages of the practice in our Baptist culture where congregational polity is the common practice, and the practicality of leadership authority is expressed. If kept in proper perspective, such as the outstanding manner reflected in the message mentioned in #2 above, and practiced in a service of worship where desire to glorify, serve, and please God is so obviously foremost, such as mentioned in #1 above, I believe the practice of ordination in Baptist life will be long lived and very helpful to maintain needed order in our congregations. I have an unusual perspective during Friday night high school football games. I am the father of the band director, whether cheering for the Bucs or the Bears – one is my son’s band and the other my daughter’s group. Of course, I am sometimes tending to a grandchild as was the case Friday night at my daughter’s game. 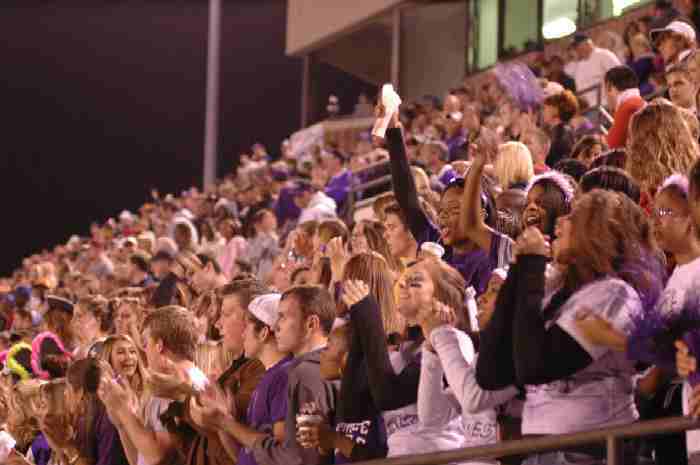 It was homecoming and the crowd was extra hyper – students exchanging seats, yelling at fellow students and climbing over one another to get to the concession stand. The stands were relatively focused when the homecoming court was announced before the game and finally the homecoming queen announced. Cheers went up, and the constant motion and noise in the stands resumed. Of course it is altogether appropriate to yell at football games and cheer for your team. I’m right in there with them, although I am not sure how many students actually knew what was happening on the field. The crowd buzz was slightly muffled during the presentation of the National Anthem, even though parents directly in front of me talked loudly through the entire presentation by the school chorus. It was all I could do to keep from asking how they would like it if their child was performing on the field and other parents were openly disrespectful. I decided to show restraint. At halftime the school’s small marching band would have received more attention playing on a gas station parking lot. In that location at least the novelty would have drawn some mild interest. The band’s show design opened with a narration of scripture reading, and the show focused on the seven deadly sins enumerated in the Old Testament. Two young girl students sitting next to my grandson and me were voting for their “favorite sins.” Fascinating! Since I could not hear the band I decided to listen in on their provocative conversation. One of them announced that she did not consider either pride or gluttony really a sin. When “lust” was announced they both exclaimed together, “Oh yeah!” Sorta like it was their favorite. Wow! To these girls the list of sins, just like showing the least bit of respect for the halftime presentation by her classmates, was strictly optional. “I like this.” I don’t like that.” “I’ll take this one.” “Ignore that one.” It was very telling. Likewise recently I have had opportunity to observe teens in worship settings planned just for them. I noticed that there is an eerie similarity in the environment that at best tolerates, and at worst actually encourages distraction. I know I sound “old fashioned” and “fuddy duddy” to call for an atmosphere that inspires reverence. I am fearful, however, that we are raising up a generation who is convinced they come to God on their own terms and in a way that pleases them, rather than on His terms and only through the means He provides. If we pump up the volume and serve up a ballgame atmosphere we should expect the same results as the ballgame. Little respect for leaders, for other persons, and an open display that God is someone who needs to entertain me to capture my attention. We talk to students a lot about bringing other students to “build the crowd,” “fill up the room,” “make it exciting.” If a visitor comes, what is the message we are giving about God’s character? What are we saying about His place in our lives? If our Christian students cannot engage in meaningful worship expression, but are screaming at each other over the loud music, then what possible difference does it make that the lyrics of said music are “Christian?” Who would know? Please do not hear me asking for saintly atmospheres where teens come in, sit with bowed heads while awaiting the leader to call them out of their meditative state. I get it that we live in a culture of distraction. I do contend strongly, however, for a very serious evaluation on the part of youth leaders, worship pastors, and others to determine how we help set the stage for worship that encourages respect for God’s presence, celebration appropriate to the spiritual reality at hand, and that fosters genuine connection among our student worshipers with the Spirit, with their fellow believers, and that conveys to non-believers that God is God. Even though worship may capture all extremes of our emotions at one point or another, distraction seems to be antithetical to what it means to worship a holy God.